4 days into my travels and I’m able to tick something off my Bucket List already. ‘Swim in the pool of a waterfall’. I booked a trip through a travel agency with 2 lads I met in the hostel. The trip cost 1000bht and this included transport, lunch, entrance fee and 2 stops. 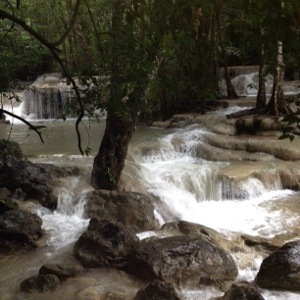 Erawan waterfalls are in Kanchanaburi which is about 2 hours outside of Bangkok. There are 7 beautiful natural falls and their beauty has been maintained as they are kept by a National Park. This does mean there is an entrance fee (about 200bht) to see them but it’s worth it to see the unspoilt wilderness. 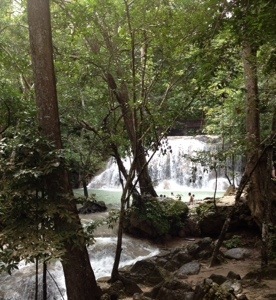 Its a long, and in some parts challenging, walk to the waterfalls. 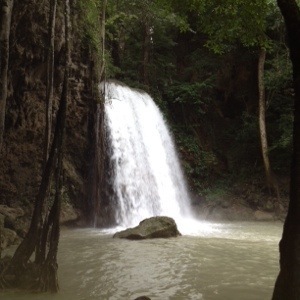 The first 3 falls are easily accessible by well laid paths and signs, the others involve, steep muddy hills, climbing over rocks and using tree roots as stairs! Although slightly hard work most people seemed to manage it. I was wearing my walking trainers and this made my trek so much easier. It was at the biggest waterfall that I chose to take a dip and although I was a bit more nervous than I expected, I loved it. 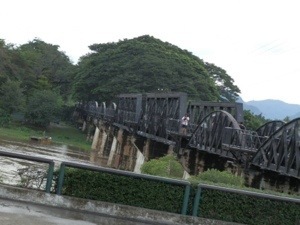 The second stop was to see the famous bridge over the River Kwai. This bridge was built by the Japanese during World War II to create a rail link between Burma and Thailand and they used Prisoners of War to build it under appalling conditions. This led to to an estimated 16,000 deaths of Prisoners of War alone. The train line over the bridge is still in use even though it is overtaken by tourists.